This is a website about Confucius. This website offers a comprehensive archive of information about the great Chinese philosopher and moral teacher, Confucius. Here you will find a collection of his writings, sayings, a biography, as well as articles about his influence on Chinese and world civilization. Confucius is one of a handful of individuals who has shaped world history. His fame and renown can be compared to great leaders and emperors such as Ramses II, or Alexander the Great, but Confucius neither never commanded an army nor ruled a state yet his teachings shaped the soul of China. Confucianism, the great system of moral and religious philosophy built upon the teachings of Master K'ung, or Confucius as he is known in the West, became the basis for personal and government morality in China. 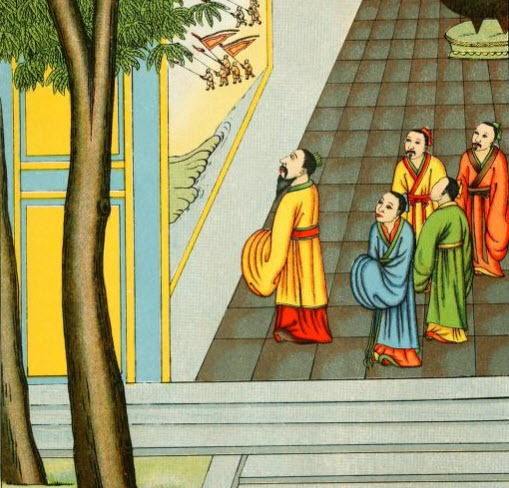 For a period of almost 1500 years, the teachings of Confucius formed the basis of the Chinese state religion and permeated every aspect of Chinese culture and society. Confucianism was stripped of its status as the state religion after the Communist takeover, but even today his teachings continue to influence modern China and its culture. Confucius as born into an aristocratic but impoverished family to an aged father and his much younger concubine, in the year 551 B.C. in the state of Lu, in what is now the modern Chinese province of Shantung. 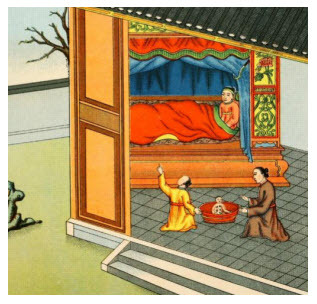 Many legends record that the birth of Confucius was foretold by miraculous events and that as a newborn, the baby Confucius was visited by many supernatural beings including dragons and gods. 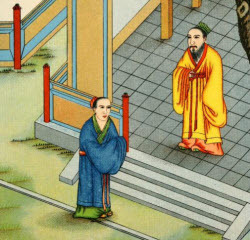 His father died when he was very young and Confucius's mother was persecuted his father's legal wives, who resented her for having borne him a son and heir. Confucius and his mother were forced to flee their home and lived in poverty. However at the age of 19, Confucius married and entered into government service for the state of Lu. 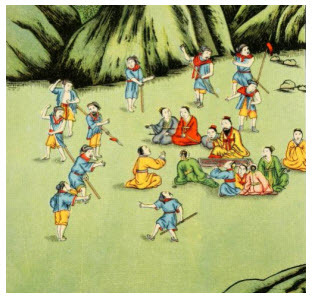 He held many posts of increasing responsibility, eventually rising to the rank of Minister to the Duke of Lu, and also began acquiring a band of disciples who were drawn to his teachings about personal behaviour and morality. In 497 B.C., when Confucius was 54 years old, he had a falling out with the Duke of Lu and was forced to leave the state. He traveled extensively throughout China, surrounded by a band of faithful followers, teaching his moral philosophy. 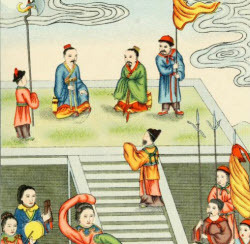 He eventually returned to his native state of Lu, where he attempted to influence the ruler but the Duke of Lu had no use for the teachings of Confucius. Confucius died in 479 B.C., a disappointed man. His son and his most promising pupils had died before him and it seemed that his teachings would not take root. But his disciples had collected many of his sayings and quotations in a book which came to be known as the Analects of Confucius, and in time the seeds that Confucius had planted took root and spread throughout China, despite some attempts by the authorities to suppress what they perceived a dangerous philosophy. The teachings of Confucius were expanded upon by subsequent philosophers and many commentaries were written. In time, Confucianism became both the principal ethos and the official state religion of China. The teachings of Confucianism were focused on practical morality and did not speculate on god or the supernatural. He emphasized the importance of justice, sincerity and filial piety - the duty of every son to serve his parents. Although Confucianism is no longer the state religion of China it still has many adherents and continues to be the basis for many Chinese customs and beliefs, as well as the foundation of Chinese morality. It is probably impossible to fully understand China without learning about Confucius and his philosophy. Had a falling out with the ruler and then embarked on career as a wandering sage and philosopher. Confucius viewed himself as a transmitter who invented nothing. His teachings emphasized the importance of study and education. His goal was not a systematic theory of life or a society that was based on formal tradition. The goal of his philosophy was to have people think for themselves, and to improve themselves by emulating examplars of moral righteousness. While several people have influenced history in many ways, Confucius is unique. Where most lords and rulers have wanted their subjects to obey, Confucius sought for people to think. This simple difference in mindset has been used in China and in different religions for thousands of years. His single greatest teaching is known as the golden rule, and is simply stated, do unto others as you would have done unto you. This type of mindset and mentality is one reason Confucius is so revered as a grand master.